Learn how to remit the sales tax you have been tracking in Kashoo. One of the many pains of small business owners is keeping track of sales taxes. For many jurisdictions, you are required to collect sales taxes on income (sales tax payable) and keep track of sales taxes paid on expenses (sales tax receivable). It is wise to check with your local tax authorities to see which taxes you need to charge on sales and whether you are able to claim back taxes spent on expenses. Note: If you check the balance of your Sales Tax Receivable account it usually shows up as a negative amount (this is because it's set up by default as a liability account, and a negative liability means you are owed money, which in this case is the money that is owed to you by the government). If you haven't set up your taxes yet, please follow our Setting Up Taxes article. To file your sales tax, go to the Sales Tax page. Select the Sales Tax, the the Period Start Date and Period End Date. Next select the tax authority you'll be paying under the Pay To field and then select a Terms or Payment Account, choosing where the money will be coming out of (if you owe the government sales taxes) or going into (if the government owes you sales taxes). If you will not be paying or collecting the taxes owed immediately, you can choose the Accounts Payable account. Note: Since the tax authority is usually a Supplier (as opposed to a Client), even if the authority owes you taxes, you would still choose the Accounts Payable account (if you choose the Accounts Receivable account it won't show up in your Aged Receivables report). 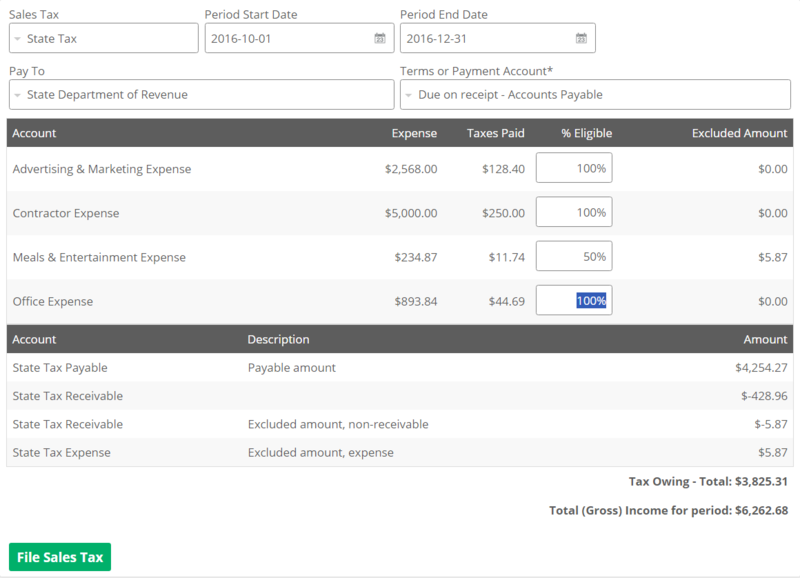 If you have been recording taxes paid on expenses, you will see a list of your expense accounts with a % Eligible field beside each one that allows you to type in the percentage that is deductible. For example, some jurisdictions only allow you to deduct 50% of taxes paid on Meals & Entertainment. So in the example, 50% was entered for the % Eligible amount. The non-deductible amount (excluded amount) is recorded as an expense (in this example to the Sales Tax Expense account). If it says Tax Owing, you owe the government money. If it says Tax Refund, the government owes you money. To remit the sales tax, press the File Sales Tax button. Once the File Sales Tax button has been pressed, you will see an Edit link that will allow you to see the transaction that you just created. Note: Even though you have filed the tax in Kashoo, you must still remit the tax with the appropriate government authorities. 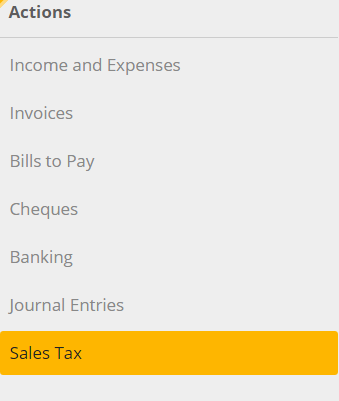 These instructions are simply for how to record your Sales Tax filing in Kashoo.